No one would accuse a chain-link fence of being beautiful. Likewise, no gardener would purposefully put in a chain-link fence if they had the funds to do something else. But there is hope for those conspicuous silver eye sores. 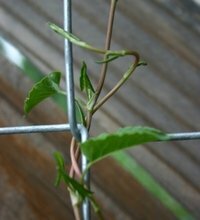 Here's how to cover one with vines in no time flat: reconsider your chain-link fence as a wonderfully large and blank trellis. The easiest solution to the problem is to put in a fence eater. Fence eater (-noun) a vine that will engulf a fence faster than you know it; May be invasive in some climates due to its vigorous nature. Some good examples of fence eaters: Silver Lace Vine, Passionflower, Trumpet Vine, Honeysuckle (not the invasive kind, please!) 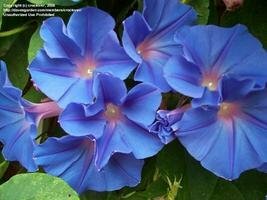 and any relative of the Morning Glory. You probably don't have a small section of chain link fence; you'll more likely have tens to hundreds of yards of fence. So if you do have a lot of links, I mean length, one or multiple fence eaters may be the way to go. But, before you set your fence eaters off to the races, let's get a plan in mind first. 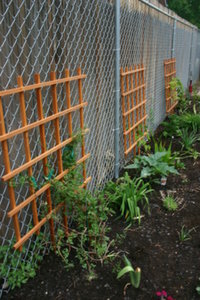 Consider starting seeds of many different vines to increase the textures, colors and shapes of your fence coverage. Vines are by far some of the easiest seeds to start. Both germination and growth are quick and easy. This is true mainly for annual vines. Starting seeds instead of purchasing vines can also save you lots of money in the end. 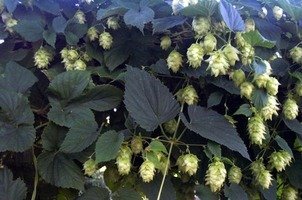 On the flip side, if you need to cover a fence quickly or you have little patience for seed starting, larger vines can be purchased at reasonable prices. Also, some vines like Clematis and Wisteria could take years to bloom if started from seed. 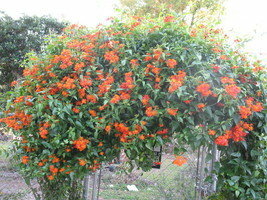 Especially with perennial vines, if blooms are your goal, purchasing plants rather than seeds will be your best bet. Annual vines will tend to grow faster than perennial vines, but with less lush foliage. Think about planting annuals mixed in with some perennials. 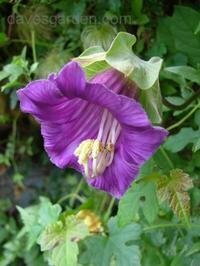 This is likely to give you a mix of large leaves with early and profuse blooms. By mixing fast growing annuals and slower perennials, you can "fake it ‘til you make it." In other words, while you wait for your perennials to fill in, which may take several years, you can get coverage with multiple annuals in the meantime. For a classic and simple look, try alternating 2 different vines. Or for a more varied look, create a pattern using 3 or 4 vines. Eventually the different patterns you create will cross and intermingle creating a more cottage-y feel. Monochromatic - Consider planting vines that bloom all one or related hues and colors. You could choose all different shades of pink, purple, or orange; you could combine different shades of blues and purples; you could choose all warm toned (red, pink, orange, and yellow) or all cool toned (blue, purple, and green) blooming vines. 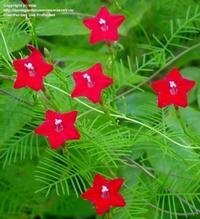 Some ideas: Mix Exotic Love Vine, Cypress Vine, and Chilean Glory Vine (all warm toned blooming vines). 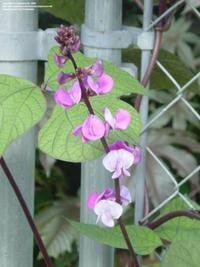 Or try mixing Purple Hyacinth Bean Vine, Cup and Saucer Vine, and Passionflower Vine (all shades of purple blooming vines). Complementary - You could also plant vines that bloom colors on the opposite end of the color wheel from each other: blue and orange, purple and yellow, green and red (in case it's been a while since your last art class). 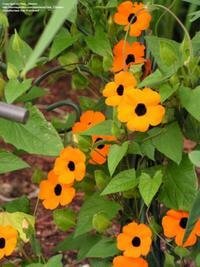 Some interesting combinations to consider: Black eyed Susan Vine and Jackmanii clematis, Cardinal Climber and Hops Vine, Blue Morning Glory and Orange Glow Vine. Talk about a statement! 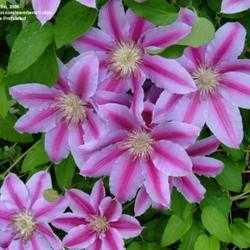 Love Clematis? Ipomoea? Mandevilla? 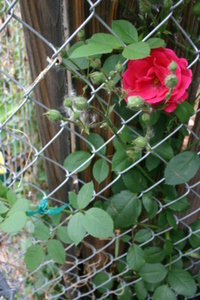 Why not create an assorted stand of varieties in one genus along your chain link fence? 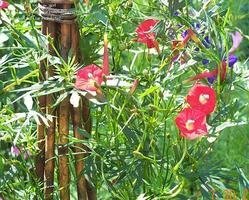 A beautiful and diverse genus, Ipomoea includes beauties such as Morning Glory, Exotic Love Vine, Cardinal Climber, Cypress Vine, and Moonflower. Each of these easy to grow annuals is different and unique. If perennial vines are what you're looking for, there are so many beautiful varieties of Clematis you might have a hard time narrowing it down to just a few. Both of these are just an example of genera that have varied, colorful, and beautiful vines that you can utilize to cover your fence. As with any part of your garden, it is always good to consider bloom time when choosing plants. 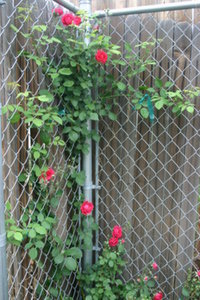 Try to balance early blooming vines with later blooming varieties to have a beautiful fence all season long. 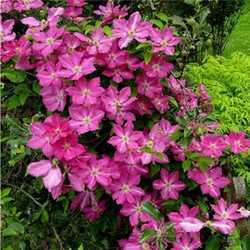 There are different varieties of Clematis that bloom from mid-Spring to late-Summer; Climbing roses and Hyacinth Bean Vine can bloom early-Summer through early-Fall. 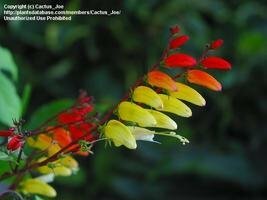 If you take the time to think about when each vine will bloom, you can have a colorful show all season long. You also have to keep in mind that some vines are very slow to get going, no matter what you do. Hyacinth Bean Vine and Moonflower are two examples of vines that resent transplanting and can exhibit slow growth for several weeks after planting. 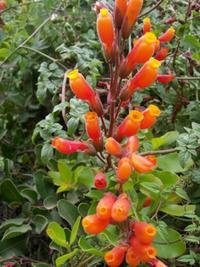 Try to balance slow-starters with fast growers such as Scarlet Runner Bean, non-invasive hardy honeysuckles such as 'Gold Flame' or 'Dropmore Scarlet', Silverlace Vine and Dutchman's Pipe Vine. To get the most bang for your buck, it is important to put in enough plants and space them correctly on your fence. You don't want to see big gaps of fence in between your vines and you don't want it to take until September for your fence to disappear. Generally speaking, vines will grow up and not out much. This may seem obvious, but when planning the spacing in between vines, you'll have to realize that unless you spend time training and pruning your vines, you may not get much lateral coverage from each vine. 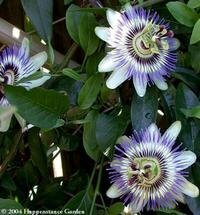 Obviously there are exceptions to this rule, but consider planting a new vine ever 8-12 inches to get a full look on your fence. Consider what each plant's spacing guidelines are, but use your best judgement when it comes to how close together to put them. If you don't want to purchase or seed as many vines, you can train vines to grow more laterally. Enter the wondrous green stretch plant tape. 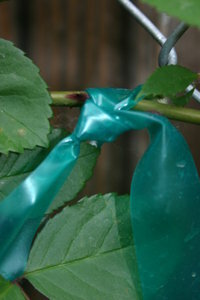 If you are having a difficult time making a vine wind where you want it, this tape works perfectly to train even the heaviest vines like climbing roses. Once the vine goes where you want it, you can remove the tape if it looks unsightly. Green stretch tape can be found at hardware and gardening stores for under $6. You may also want to give your plants a little additional support. Trellises and wood supports can be added to provide extra support for fragile plants or add some style until the fence is covered. 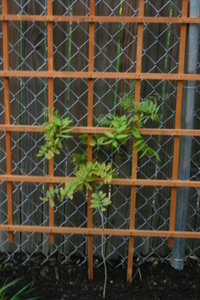 If you have a particularly fragile vine, sometimes a metal fence can heat up and adversely affect your plant. If you live in a zone where vines die out during cooler weather, don't forget to think about how the fence will look "in the buff." 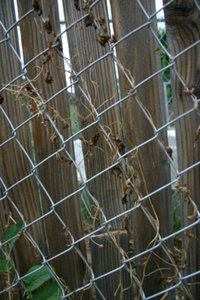 Are you going to have unsightly brown stems covering the fence that you can't take down? 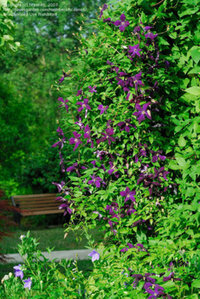 Some clematis vines not only don't need pruning, but need to keep their old wood for future blooming. Additionally, if you plan to plant any annuals, think about how dry, shriveled vines will look once the beautiful blooms die and how much fun they will be to pick out from their windy path through the fence. In colder climates (Zones 6 and lower), there's not a whole lot you can do for year round beauty. You can grow vines with interesting seedpods or colorful stems, but there are no evergreen vines that will stay beautiful year round (whatever you do, please don't plant English Ivy). However, if you are in Zone 7 and higher, you have a fairly good assortment of evergreen vines which can obscure your fence all year long. 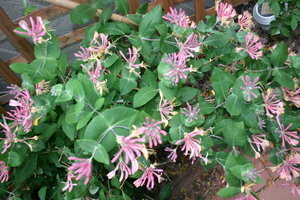 Some evergreens to consider: Confederate Jasmine, Sweet Autumn Clematis, and Crossvine. 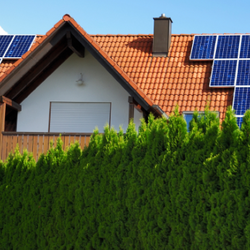 Finding exciting and beautiful vines to cover your fence won't be the hard part, choosing will! Hopefully with these tips you can make the best of your chain link fence and make that blemish in your landscape a thing of the past. Chain link fence thumbnail- thanks to Dani Simmonds!